What is the GLSEN Local School Climate Survey? The Local School Climate Survey (LSCS) is a tool developed by GLSEN's Research Department for students, educators and advocates to assess the safety and overall environment of their local schools or communities using surveys of students. It allows you to select from pre-loaded questions to build a survey, as well as create your own questions. The surveys are designed to be taken by middle and high school students (specifically ages 13 and up). This tool also provides you with a report of the results from the survey you create. 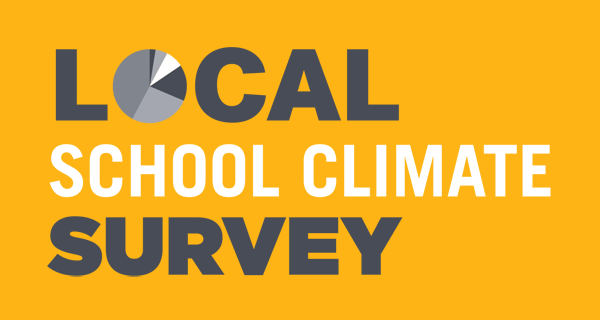 The Local School Climate Survey is meant to be used at the local level for school, district and local communities. This survey is not intended to be used at the state, regional or national level. If you want to use the Local School Climate Survey tool to conduct a national, state or regional (e.g. several states, i.e., Mid-Atlantic region) survey then please contact us at localsurvey@glsen.org. Current Users: Log In Here! Click here to have a password reset link emailed to you. Click here to have the activation link emailed to you again. New to Our System? Create an Account! If you are interested in taking the survey, you should have been provided a direct link by someone else. Please click on that link directly to be taken to your survey. If you are interested in creating a survey to assess your school/community climate, please log in or create an account below. Enter your email address and create an 8-20 character password twice. You will be sent an email from "info@localschoolclimatesurvey.org" with an activation link. Please check your spam/junk folder and if possible mark that email address as non-spam. ▼ How is the LSCS related to the National School Climate Survey? The LSCS is based on GLSEN's National School Climate Survey (NSCS), a biennial survey of the school experiences of lesbian, gay, bisexual, and transgender (LGBT) students in U.S. secondary schools administered by GLSEN's Research Department. Results from the NSCS and accompanying state-level data for selected states have helped advocate for LGBT students at national and local levels. Since the first national survey in 1999, GLSEN has heard from members of local GLSEN Chapters, from Gay-Straight Alliance members, from educators, and from community advocates that they want to conduct the GLSEN survey in their local community or their school. Because of these requests, GLSEN created the LSCS. It is similar to the NSCS except it is a survey that can be given to all students, not just LGBT students. The LSCS online platform builds upon the original paper (PDF) version of the LSCS that had been previously available to download by providing a customizable online tool that allows you to create your own LSCS, administer it easily, and view the results. ▼ Why should I create a Local School Climate Survey? This survey is intended for students in grades 7-12, and asks about students' perceptions of their school climate, including biased language, harassment, and the availability of resources and supports. (Note: students who are age 12 or under will be automatically screened out of the survey because the survey is designed for an older age range). Results from the survey can help to inform educators, administrators, and the entire school or community about students' experiences in school. With this information, you can help identify areas for change and advocate for a more welcoming learning environment in your school or community. ▼ What do I need to consider before administering the survey? To get the best idea of the school or community climate, we recommend that the survey be given to as many students as possible in your school or community. Although you can survey just the senior class or even just the students in one particular class, the smaller the scope, the less representative your survey will be of all the students in your school or community. For example, students who take French may have different experiences than students who take Spanish or German, so you cannot make generalizations about all students in a school if you only ask students who take French. Do I need permission to conduct the survey? Once you have an idea of who you want to participate, you may need to get permission from the school(s) or district(s) those students attend or other locations where you plan to reach students (e.g., a local community center or youth group). You may need to meet with the administrator(s) to discuss the purpose of the survey and why it is important for students to take it. Do students need to agree to take the survey? The online survey template provides an introduction to the survey which provides possible student participants a description of the survey, and informs them that the survey is anonymous and voluntary. Students are then able to decide if they are willing to participate in the survey and provide responses to the survey items. Participants may decide to stop the survey at any point in time, or skip any questions that they do not want to answer. Do I need a consent form for students? What about parental permission/consent? Whether or not you need official consent from students or parents will depend the school requirements. For those who are not using the survey as part of a formal research study, clear information about the survey and what students are being asked to do might be sufficient, but you should check with the school or district administration to be sure. If you are using the survey as part of a research study you will most likely need to obtain assent from students (youth under 18 cannot legally provide "consent," instead they can provide "assent'') and potentially parent consent. Here are some tips for what to include in your assent/consent forms, you could also view some example forms for students and parents. ▼ How do I create a survey? If this survey sounds like it fits your needs, create a user account on the main page, or if you already have an account, just log in. Then you will be directed to create a new survey or modify an existing one. Once you are logged in, you can build your survey using pre-loaded questions as well as have the option to create your own questions, and then distribute your survey and analyze your results (see below). ▼ How do I distribute the survey? You can choose to distribute the survey only online, only via paper, or using both methods at the same time. Once you create a survey, you will be provided with a unique URL that can be used to direct students to the survey. Directing students to take the online version of the survey will permit the fastest response and analysis of survey data. However, using paper surveys (also available for download) or allowing some students to use them may be an important strategy in reaching students of your school or community who may have less reliable access to the Internet. In addition, your school or community may have clubs or groups (e.g. a local LGBT center, diversity club) that may be interested in making your school or community a safer, more tolerant place for all students. You may want to partner with them to advocate for the survey and to help in getting the survey done. ▼ How do I get the results? If you choose to administer your survey online, once you create your survey, you will be provided with a unique URL which you can name. You can then distribute this URL to students you are asking to take the survey (e.g., emailing students the URL, posting it somewhere in your school/classroom, or handing out the URL information hard copy). Once students take the survey, you will be provided with summaries of the responses to each survey question, including tables and charts. You will also have the option to download an Excel file of the complete data for your records and to perform your own, additional analyses. If you used paper surveys instead of or in addition to online surveys, you can choose to enter each survey yourself (i.e., as if you are the respondent) in the online survey system by going to the designated URL for survey takers. This way, you can still utilize the online results tabulation function and it also allows for the paper surveys to be analyzed with any surveys that may have been taken online. Alternatively, if all surveys are taken on paper, you can enter the responses in your own spreadsheet or data file (e.g., Excel, SPSS) instead of using this online tool for analysis. ▼ What will my results tell me? The results will tell you the responses provided by the students who took the survey for each question in your survey. For example, if you included these questions, the survey results can tell you how often students hear biased language—such as homophobic, racist and sexist remarks—in school and where students feel most unsafe in school—classrooms, locker rooms, bathrooms, etc. Also, if you added any of your own questions to the survey, the results will provide the responses to those as well. It is important to remember that this is not necessarily a scientific survey; the survey findings apply only to the students who take your survey and may not be representative of all the students in the school or community. ▼ How will my information and data be protected? All personal information of survey creators is protected and kept confidential. All account information is accessible only to the survey creator via password protected account and to LSCS administrators (staff members of the GLSEN Research Department), who will access such information only on an "as needed" basis. * GLSEN will not divulge the name, contact information, or log in information of the survey creator to anyone without the survey creator's express written permission. NOTE: You will have the option to designate a survey contact person and email address when creating your survey—this is the only information about the survey creator that we will provide to survey takers. *There may be times when GLSEN will use your information to provide you with services such as survey creation and technical troubleshooting. We may also use your information internally to monitor, maintain, and improve the Local School Climate Survey tool features and the services we provide externally. We will not use your information for marketing purposes or for any other purposes unrelated to the survey(s) you create. All survey data is owned by the survey creators. GLSEN treats all surveys as private. We store surveys and survey responses for the survey creators' use only. All created surveys and related data are password protected through the survey creators' individual accounts. We do not use the surveys or the survey responses collected for our own purposes. We do not distribute these surveys or survey results to anyone without the express written permission of the survey creator, except in a limited set of circumstances (e.g. if we are compelled by a subpoena, if there is a legal question of harm, or if you made your results public and available for sharing). Surveys are administered by survey creators. GLSEN hosts the Local School Climate Survey tool on our website and responses are collected through our tool. These responses are only available via the password protected account of the survey creator. If someone has a question about the survey they are taking, they should contact the survey creator directly. GLSEN is not responsible for the content of any surveys created through the Local School Climate Survey tool or the responses to it. The survey creator is usually the same person that invites people to take the survey and their contact information is also available on the survey. GLSEN will not divulge the name, contact information, or log in information of the survey creator to anyone without their express written permission. ▼ Do I have to be part of GLSEN to use the LSCS? No, the LSCS is available for anyone to use, regardless of their affiliation with GLSEN. It is designed to help students, educators, and advocates obtain data that can be used to improve the safety and overall environment of their local schools.